As the world’s leading WordPress forms plugin, people use Gravity Forms in weird and wonderful ways. Today I’m going to show you how to use Gravity Forms to allow users to add information to your website and submit it to you. You’ll learn how to automatically store the data as a WordPress post, WooCommerce product (or any other custom post type) and display the Gravity Forms entries in a table on the front end. The end result will look something like this – a neat table listing your users’ form submissions! Sound a bit random? Well, you’d be surprised at just how many people contact us asking how to do this. Let’s look at some examples. Why display user-submitted information in the front end? WordPress document library with user-submitted documents. Lots of websites use a WordPress document library plugin to allow users to find and download documents. If you need a way for users to submit their own documents, then you can do this with Gravity Forms. WordPress member directory with user profiles. If you’re using a WordPress member directory plugin to list members or consultants in a table, then you might want to allow people to register and upload a profile. If you don’t want to install a heavyweight membership or e-commerce plugin, then it can be simpler to use Gravity Forms for the member registration and profile upload. WordPress directory website. If you’re creating any type of directory, such as a business or local events directory, then it makes sense for users to submit listings. If you’re trying to keep your website simple, then you can avoid installing a full directory theme or plugin by using Gravity Forms and a WordPress table plugin instead. You can even take payment via PayPal and hold submissions for moderation by the administrator before they’re published! WooCommerce user-submitted products. If you’re using WooCommerce then you can let users submit products to sell in your store. User-submitted events. If you’re using a WordPress events plugin such as The Events Calendar, then your users can submit events to display on your website. I’m sure there are also lots of reasons that I haven’t come across yet. (I’d love to hear about your own use case in the comments below!) Whatever your reasons, I’m going to show you how to do it. 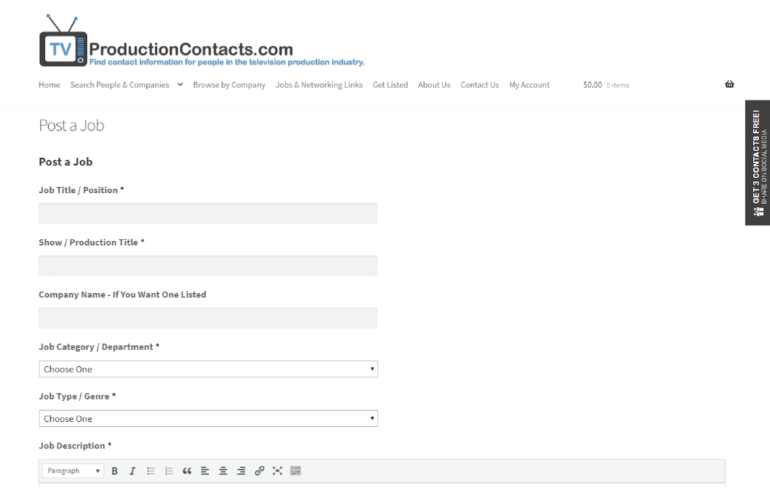 TVProductionContacts.com acts as a networking site for TV production professionals, it also hosts a WordPress job board listing jobs available in the industry. The job board is powered by our Posts Table Pro plugin. The site also uses the Gravity Forms plugin and the Gravity Forms + Custom Post Types add-on to power the job board submission form. Gravity Forms makes the job board simple to manage. Hiring managers submit all the job details using the form. The user-submitted information is then approved before being automatically displayed in the sortable job board. Keep reading to find out how to create your own form for users to submit information to your site. The first step is to install the Gravity Forms WordPress plugin and create a form. Your visitors will use this to submit information to you. This is useful whether you want them to upload a document, member profile, business listing, upcoming event, or something else. First, buy Gravity Forms, download the plugin and install it on your WordPress website (Plugins > Add New). You’ll see a ‘Forms’ link appear in the left of the WordPress Dashboard. Navigate to Forms > Add New. 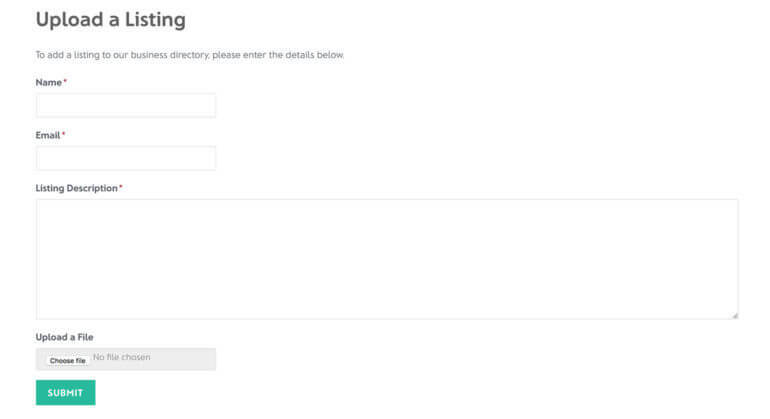 Enter a name for your form, then add all the fields. (If you haven’t done this before, please see the official documentation.) If you want users to be able to upload documents via Gravity Forms, use the ‘File Upload’ field type. Click ‘Update’ to save your form. Finally, view the page and make sure you’re happy with it. Some people use Gravity Forms to collect user-submitted content from specific people only. You can do this by protecting the page containing the form. The simplest way to secure the Gravity Forms page is to password protect it. If you’re using an SEO plugin (e.g. Yoast SEO), then you can also use this to noindex the page. This will ensure it is hidden from search engines. So far, you’ve learned how to use Gravity Forms to create a form that users can use to submit information to you. It looks pretty, but it’s not much use yet! At this stage, the information will be emailed to you and stored in the WordPress database. In Step 2, I’ll show you how to automatically use this user-submitted data to create WordPress posts, WooCommerce products, and custom posts. This saves you having to manually input the data to your website. Gravity Wiz have an excellent tutorial about how to save Gravity Forms submissions as posts. Do this, then come back to learn how to display the user-submitted content in a table on the front end. When you follow the Gravity Wiz tutorial, don’t forget to set the ‘Status’ to draft. This is essential if you want to hold the form submissions for moderation for an adminstrator to approve before they’re published. Storing user-submitted information as normal WordPress posts is fine, but it can clutter up your blog. It’s normally better to create a dedicated custom post type for this. For example, if you’re creating user-submitted business listings then you can create a ‘Business Listings’ custom post type. This will add a ‘Business Listings’ link to the left of the WordPress Dashboard. It’s a convenient way to organize the listings, separate from your other website content. You’ll also need to do this if you want to store Gravity Forms entries in a post type created by another plugin. This might be the ‘products’ post type created by WooCommerce, the ‘tribe_events’ post type created by the Events Calendar plugin, or any other custom post type. Get the plugin and install it on your WordPress site. If you don’t already a custom post type for this purpose, create one now. I recommend the free Pods plugin for this. For full instructions, please see my tutorial about how to create a custom post type, then return here and continue this tutorial. Use the how-to instructions on the plugin page to map your form fields to the custom post type. So far, you’ve learned how to use Gravity Forms to let users submit information via your website and save it as a post or custom post type. The next step is to display the user submitted posts on the front end of your WordPress site. You’ll need our Posts Table Pro plugin for this (or WooCommerce Product Table if you’re displaying user-submitted WooCommerce products). Posts Table Pro is a WordPress table plugin designed to list posts and other post types in a searchable, filterable table view. It’s the perfect way to display user-submitted information because each entry is listed in a separate row of the table. Visitors to your website can use the search box to find specific entries, use the filters to refine the list, and sort by any column. Get Posts Table Pro and install it on your WordPress website. Copy your license key from the confirmation page, then enter it on Settings > Posts Table Pro. Stay on the settings page, and spend a minute choosing how you want your tables to look and behave. Next, create a new page. You’ll use this to list the user-submitted content from Gravity Forms. Click the ‘Insert Posts Table’ toolbar button. This will add the shortcode [posts_table] to the page. Finally, view the page. You’ll see all your posts or custom posts (depending on which post type you selected on the plugin settings page) listed in a table on the front end. This is the information that your users have submitted using Gravity Forms. Perfect! You may wish to add multiple tables to your site, each containing different posts or custom posts. For example, if you’re building a WordPress business directory then you might want to add a table listing posts from a different category on each page. Fortunately, Posts Table Pro comes with several options for choosing which user-submitted content is listed in the table. You can read about them all here. Can users edit posts after submitting them? Unfortunately, it’s not possible to use Gravity Forms to edit posts or other information after it has been uploaded to your WP website. Instead, I’d recommend using WordPress front-end editor plugin such as Editus. The way it would work is that people would click through to the single document page on your website. This is important because they can’t edit the content from within the Posts Table Pro table itself. On the single post page, they can edit the content as required. The Posts Table Pro plugin can only display posts or custom post types. Gravity Forms stores form submissions in a separate database field which you can’t list directly in a table with Posts Table Pro. That’s why you need to follow the above instructions to automatically save the data as a post or custom post type, and then display these entries on the front end. What sort of user-submitted content do you display? That brings us to the end of our tutorial. You’ve learned how to use Gravity Forms to allow users to upload information to your website and save it as a post or custom post type. You know how to hold these posts for moderation so that they’re not published until an administrator approves them. You’ve discovered the best way to display this information in a table on the front end of your WordPress website. It’s the perfect way to create a user-contributed document library, member directory or business listings. I’d love to hear about how you use Gravity Forms for user-submitted content. Do you keep this private or list it on the front end of your website? What sort of data do you collect and display? Please let me know in the comments below.